Is Aluminum Really the Best Material For Louvers? As it turns out, aluminum is actually one of the best materials for making louvers. There are a number of businesses and industrial facilities that can benefit from the installation of commercial louvers—but do you know what material is typically used to make them? Consider what louvers are used for first. They can help reduce heating and cooling costs, help establish privacy, and can be used to establish boundaries for your property. With this in mind, it’s clear that aluminum is the ideal material for louvers. Still unsure? Read on below to find out exactly what aluminum fits the bill as the best material to use when building louvers for a commercial building. As a business owner, you really don’t have the time to be double-checking that your louvers are functioning and looking great. In fact, you should have the expectation that they won’t fail you and will keep doing what you need them to do. Aluminum is perfect for that because despite being lightweight, it’s an incredibly durable material capable of resisting rust, damage, and corrosion. Spend time on your business and don’t worry about your louvers. They’re also resistant to environmental damage and won’t fail when the weather gets rough. If you’re the kind of person who worries about the environment, then aluminum is a great option. It’s completely recyclable which means that it all ends up getting reused in the end. This is great if you’re the kind of person who cares about reusability and helping reduce overall waste. This is especially important when removing your louvers, as you can rest easy knowing that you’re not contributing to a problem by using aluminum instead of some other building materials that are out there. Because aluminum is so lightweight and flexible, it also makes for a very flexible, customizable design material. Aluminum can be bent and reshaped in whatever ways you need. This means that no matter what area you’re trying to find, there’s almost always going to be a louver that can be made to fit it. 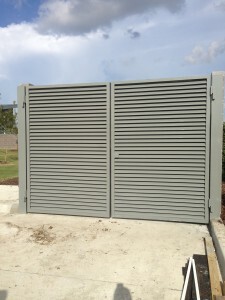 There are also variations in what kinds of louvers and how big the gaps are in the slats, which means you can find something that works for whatever your specific needs are. This entry was posted on Friday, October 12th, 2018	at 12:46 pm	. You can follow any responses to this entry through the RSS 2.0 feed. Both comments and pings are currently closed.